I love to read. I love the idea, when I’ve unearthed a book from the bottom of a pile in a musty old bookstore (the few that are left), that the pages have gingerly been turned by so many other lovers of words. I love that books are one of the few lasting universal threads linking generations and cultures together. And I love that books can be full of information, inspiration, or imagination. But as much as I enjoyed reading to them, I was excited for them to read on their own, knowing that their young imaginations could bring the words and worlds to life better than any animator or screen director could. Of course they would be early readers just like I had been. Of course they would have no difficulty simultaneously learning to read in two languages. After all, they had easily and naturally learned to speak English with me and French with their father. Of course, because reading would come so naturally to them, writing would flow fluidly as well. Of course, that’s not what happened. The truth is, at seven and eight, my children still hadn’t learned to read. Or write. Worst of all, they had absolutely no interest in doing either. I strewed “age-appropriate books,” I modeled good reading behavior, I made sure they saw me writing, I continued reading to them. I spelled words for them when they asked. But getting my kids to actually read even the simplest of words? Nope. No thanks. Not interested. I read articles on the great reading debates, phonics versus the whole language approach, as well as accounts of unschooling parents, many of whom gave a similarly vague version of how their child simply started reading one day on her own. While I was glad to hear it, I really wanted to understand more about the motivation and the mechanics. Ok, they learned how to read, but how and why? My frustration and doubts were increasing. Were we missing some crucial reading age window, as so many educational experts claim? If they didn’t learn to read soon, would it become increasingly harder? 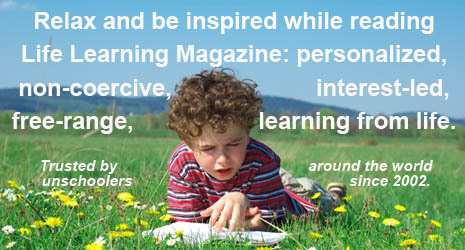 And if they couldn’t read, were we hindering other important learning experiences? My husband’s reassurances (“they’re not ready yet, don’t worry, it’ll happen sooner or later”) would make me feel better until the mother of one of their schooled friends would casually ask, “They know how to read and write, don’t they?” or I would see a much younger child happily devouring the third book in the Harry Potter series or texting his mother about what time she should pick him up. These incidents would send me into a tailspin of insecurity. Why weren’t my children reading or writing yet? And out would come the worksheets, the easy readers, and my not so subtle prodding. My kids would indulge me for a few days, then I’d get frustrated that they weren’t taking it seriously and abandon my efforts. Then I’d chastise myself for not being the trusting unschooling mother I longed to be and we’d all go about our business once again. "Instead of focusing on what they weren’t doing, I tried putting my energy into taking notice of and nurturing what they were doing. And what they were doing – in cultivating their individual passions – was slowly learning to read and write." This cycle went on for close to a year until I realized that I was the only person bothered by the fact that my children weren’t curled up in a chair reading a book. This was clearly my problem, not theirs. So instead of focusing on what they weren’t doing, I tried putting my energy into taking notice of and nurturing what they were doing. And what they were doing – in cultivating their individual passions – was slowly learning to read and write. Here are their stories. When Sunny was five, she met her first real friend – Lily – who would inspire many aspects of Sunny’s life. Lily is quite beautiful, with long, silky hair the color of vanilla ice cream and large white teeth. Lily is a horse who galloped past our house one day with her teenaged owner, Julia. Within two weeks, Julia had given Sunny her first riding lesson, a bare-backed half hour of bliss atop Lily that quickly became a weekly ritual. Shortly after, we took care of Lily for a month while Julia went on vacation. Every morning, Sunny was up at dawn lugging feed and water into the enclosed pasture (spilling most of it), brushing and braiding Lily’s mane and talking to her about the upcoming day. When Julia moved Lily to an equestrian center near our house, we went and visited her and Sunny met all the other horses and ponies. She’s been taking horseback riding lessons ever since and volunteers her time every Saturday morning to help train and groom the horses. Lily is still her favorite. Recently, my husband gave Sunny a very thorough book in French on horses, covering training, grooming, and riding. Although it has lots of beautiful pictures, it’s more of an encyclopedia than a book geared towards children. Nevertheless, Sunny spends hours pouring over the pages and began taking it with her to show her instructor and ask questions. She also loves horse magazines, which have pictures, crossword puzzles, and quizzes. Recently, she started reciting the names of all the detailed equipment as she pointed them out to me in her book. Then she showed me a simple crossword she’d completed by looking at the icons, finding the pictures in the book and copying the corresponding word beneath it. Pretty soon, she was able to recognize the visual words in association with the oral vocabulary she had obtained by asking questions and linking them to the pictures. She was being a detective. Then one day, she asked if she could please have a brand new notebook and a few colored pens. She chose a small notebook with horses on the cover and purple and pink pens. When we got home from the store, she asked me for a pair of scissors and went into her room for several hours, coming out only to ask my husband questions. When she came out, she had written a story in French about six wild horses and a little girl who tames them through patience, trust, and love. She had cut out and pasted pictures to illustrate it. “How did you do that?? ?” I asked. I was astonished. (Ok, I was blubbering.) She had gone through her book and magazines and picked out the words she recognized, found other simple words from the stories in her magazines and asked her dad to help her spell the words she was missing. Basically, she had used clues to put together a collage of words to form a cohesive story. Because she had written it herself, she was able to read it back to me. What amazed me the most was her written vocabulary, which was much more sophisticated than I had ever guessed. She had written this sentence, which translates to: “The little girl and the horses fell asleep beneath a sky resplendent with stars.” What I later learned is that the years of being read aloud to, in both French and English, by my husband and I had given our children access to vocabulary we wouldn’t use in a typical conversation. And because we read books that were beyond their normal reading age, this vocabulary was much richer than what they could be expected to read. "Because we read them books that were beyond their normal reading age, their vocabulary was much richer than what they could be expected to read." "School book publishing houses all have. . . lists . . . of words that kids can be expected to read at various stages in their progress through the elementary grades. How they compile these lists is a mystery to me. But somehow or other . . . with divining rods or something . . . they’ve figured out the number of words that a teacher can ram into the average child’s noodle . . . He can, of course, recognize some 1,500 spoken words when they enter his head through the holes in his ears." In contrast to his earlier rhyming board books, which relied on simple word repetition and phonics and were meant to teach children to read, Geisel began publishing experimental stories in magazines that were meant to be read aloud to children by their parents. They focused on a more sophisticated and fanciful vocabulary (including his famous use of pseudowords) and relied on “heavy auditory appeal.” I had been reading these and many other stories to them for several years because they are favorites, for reasons I didn’t fully understand. In Sunny’s case, she began using some of this now-familiar vocabulary, copying words she recognized. That led first to writing, then word recognition, and finally reading. The fact that she wants to write complicated words, which she already knows orally, means that she will be able to read them as well. All it took to inspire her was a white horse and lots of patience, trust, and love. "Because they are interested and strongly motivated, (children) use whatever clues are available to figure out the meanings of printed words and sentences, and along the way, with or without help, consciously or unconsciously, they eventually infer the underlying phonetic code and use it to read new words." When Jamie was in kindergarten and first grade, he was often chastised for mixing up his letters and had a hard time reading. As a result, any pleasure and confidence he might have gotten from learning to read got zapped right out of him by being reprimanded. His workbooks, to the dismay of his teachers, were often filled with elaborate drawings of landscapes, planets, and maps rather than letters and words. He wanted to learn about the world, but geography wasn’t yet on the curriculum. When we took him out of school shortly afterwards, we bought him atlases in English and French and books about geography, history, and the solar system. He soon learned how to navigate his way around Google Earth and other related websites and is now able to identify almost every country on the globe. He first learned to recognize their forms, then eventually to understand the meaning of the letters forming their names. Now he can spell these names when he wants to look up photos on the Internet of a particular country, city, or island. He can do this in both English and French. Recently, he began writing these names on his drawings, on which he still spends several hours a day. This is his passion. Learning about the world has also fostered a strong desire to travel and explore the world, which has led to an interest in aviation and transportation, learning about other cultures and languages. We’ve recently started to learn German online. While he “writes” most often on a keyboard in order to navigate the Internet, his reading skills are improving daily, not due to any prodding, worksheets, or forced reading and not according to any identifiable methodology. 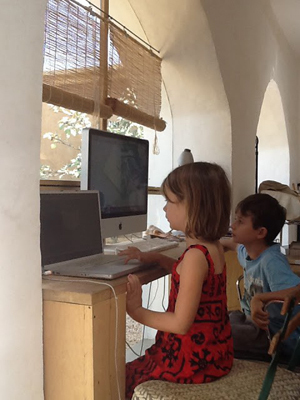 Jamie is learning to read and write, like his sister, because he is motivated by his passion. And I try to nurture his passion by reading books to him that I think he’ll enjoy. We recently began reading The Little Prince, which touches on all his favorite themes. He told me it’s the best book ever written and that it will be the first book he reads by himself. And then he drew a sheep, just for me. Ellen Rowland is an American living abroad with her husband and two children. She writes about people, sustainability, culture, children, family, and food. She has contributed several articles to Natural Life and Life Learning Magazines and blogs at www.Senegalease.blogspot.com.